Hazrat Maulana Nur-ud-Din passed away on 13th March 1914 — may Allah raise his grades to the highest level! To mark this centenary I have collected some articles about his life. Please see this link. Three of these are news published in Ahmadiyya organs at the time (one English, two Urdu). The image above is the head of one of these. Respected and honoured Khwaja sahib, assalamu alaikum wa rahmatullahi wa barakatu-hu. — Paigham Sulh, 3 March 1914, p. 1. This entry was posted on Wednesday, March 12th, 2014 at 9:53 pm	and is filed under Ahmadiyya issues. You can follow any responses to this entry through the RSS 2.0 feed. You can skip to the end and leave a response. Pinging is currently not allowed. Mention of HMGA in lectures of Maulana Noor-ud-Din sahib. Some years ago a Qadiani physician, living in Fremont, California, USA, on an internet forum discussion criticised Holy Quran translation by Allama Noor-ud-Din rendered into English by his son and daughter in-law. His objection was that HMGA name is not mentioned in translation by Abdul Manan Omar and Amtul Manan Omar. I gave him an answer. 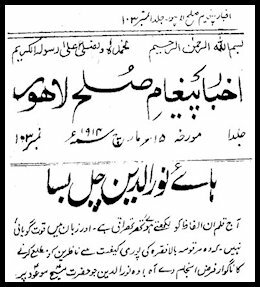 I wish i had read the Badr April 22, 1909. He would have got answer from Allama. Is an authentic copy of, or information about, the Will/Wassiyat of Maulvi Hakkim Nur-ud-Din Sahib (ra) publicly available? Did he give any guidance on how the Community should go on, after his time? On Sunday last, 16th March, I watched live the webcast from Darus Salaam, Lahore (Centre of Lahore Ahmadiyya Movement), of the meeting held to commemorate the centenary of the death of Hazrat Maulana Nur-ud-Din. There was one speaker unfamiliar to me, by the name of Professor Jamil Umar, paternal grandson of Hazrat Maulana Nur-ud-Din, who delivered a detailed speech about the Hazrat Maulana's life. It was most impressive and informative. Sadly, news has been received that the next day, while at his office, Prof. Jamil Umar died suddenly. Inna lillahi wa inna ilai-hi rajooon. May Allah have mercy on him and join him with His righteous servants, ameen. Aged 62 years, he had been suffering from heart problems for the last two years. His janaza was conducted at Darus Salaam, Lahore. Prof. Jamil Umar speech on his grandfather Maulana Noor-ud-Din. Prof. Omar delivered 45 minutes speech on different aspects of life of his grandfather. I knew Jamil at QAU Islamabad. We were in same computer science diploma. Jamil I knew of that time was a happy, fun, innovative, taking all kinds of initiatives – good and mischievous. That was I think 1976. After that we went our separate ways – I to bank, he to continue as MSc student and later as prof. Our paths crossed several times and he always remained a friend. i feel that there are large swaths of his life that remained unmentioned. I am sure the leftist political hacks shall keep writing and talking for at least years to come. I am interested more in his private life, his parents, brothers, sisters etc. Without crossing anyone's privacy, I shall deeply greatful if I could contact his family members, friends, etc. And I will totally understand if for personal reasons they want to refrain from doing so. Dear Dr. Zahid Aziz: In your Collection of Articles about Hazrat Maulana Nur-ud-din sahib (link), may be you can also add the following esteemed opinion of HMGA about him in "Victory of Islam" (link) – and the corresponding footnote (link).